(MATT) I first woke to the sound of raid drops about 6 a.m. I got up and brought Sam's and Chris' shoes into the tent so that they wouldn't get wet. Then around 6:45 a.m., it really started raining so we closed the front and back flaps. We all were awake and enjoying the rain. Jon said, "Boy, this is great, its like God wants us to sit back and take it easy today. Unfortunately, Jon had it backwards because then it really started raining and blowing. God wanted us out of that tent NOW. Well, He got what He wanted. The bum leg of the tent came loose and I jumped up to grab it. I held up the tent while Chris re-inserted the leg into the correct position. Then the rain fly blew loose. Let me re-iterate: it was really raining and the wind was blowing like crazy. Chris and Jon stripped down to their shorts and went out to re-affix the rain fly and were wet to the skin by the time they made it out the door. Then it started to hail. They came back in and the whole tent started caving in. We all grabbed part to hold it up. We were all standing there holding up the tent wondering if we had reached an impasse with the storm and would be able to wait it out in discomfort but still inside the tent. The answer was NO. The storm beat us completely. As we stood there holding it up, the rain fly came off and the rain was coming right in the tent. Sam and I stood holding up the tent while Jon and Chris rolled the sleeping bags and packed my bag, which was soaked as well as its contents. As we opened the door of the tent again, we couldn't help but notice that the tent was standing in about 3 inches of water. So in defense of the tent, we would have gotten soaked even if the typhoon had not knocked our tent down. Jon and I ran all the stuff to the car; then Chris and I ran the tent to the bathroom, while Sam and Jon looked for stakes and came after us. Jon and Chris jumped into the showers, clothed, to warm up while Sam drove the car to the bathrooms. Chris had done his laundry the night before and left it on the car to dry overnight. And there it sat, draped on the hood sopping with water as Sam drove both the car and the laundry over. Then Sam jumped into the shower as well. Well, we weren't sure what to do next. The tent was soaked, sleeping bags soaked, clothing soaked. So what to do? Well, we loaded up all of our wet stuff, drove to Venice, and left our stuff and troubles behind in a parking garage and proceeded to take a walking tour around the old water-filled town of canals, gondolas, candy, pizza shops, and tourists. We had been warned that Venice was very expensive so we planned on buying nothing. We ended up buying some blood oranges and pizza for lunch and later some strong black licorice for dessert. 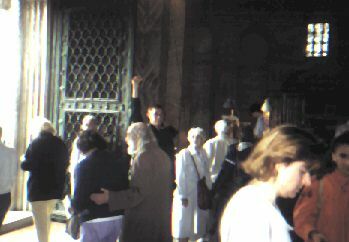 We caught Mass that morning at a quiet little church with a few local old ladies, afterwards walking to San Marco Square and the Cathedral San Marco, which was full. (CHRIS) The streets of Venice were very confusing. They went in any direction they wanted and they were all made of water, so there was no jaywalking. We could only cross at the bridges. It was fun just wandering about and watching the boats and people. We saw no cars or motorbikes, but did see the UPS boat and boat buses and taxis. 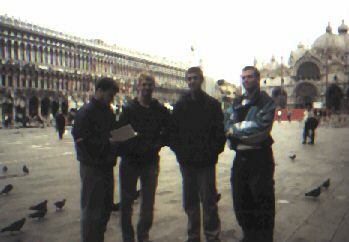 When we got to San Marco Square, everyone was impressed by its huge size and decorative architecture. We posed for our usual "Four Guys in Front of a Church" photo taken by a friendly stranger, and then we went in the church. 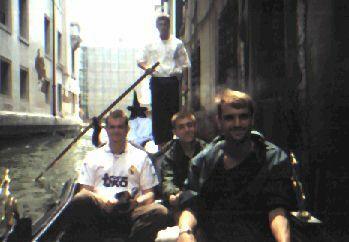 All they guys were wimping out on the you're only gonna be here one gondola ride, so I treated them and off we went. It was a really comfy boat about 25 or 30 feet long. It had room for six or eight, but us four had it to ourselves. Our driver didn't talk much; he knew only a little English, but he was cool. At first, the ride was a bit bumpy and slow, but then we got on the small side streets and cruised along inside tight alleys and passed under envious tourists on the bridges. It was a 35 minute ride and it was worth it. We began the trek back, stopping for a calzone along the way. Then, 15 minutes later, we stopped and bought these really thick, heavy cough dro... I mean, licorice sticks. Matt and 1 ate about three sticks. Sam and Jon had ten each. Stomachs of steel! The walk back was pleasant and we saw no real rain. We saw an accordion player who Sam gave 200 l., but the guy yelled something at Sam. Either he thought Sam was cheap or was taking and not giving. We went to the garage and ransomed our car for over $20 and headed for Padua. The Renault places were all closed, so our 7500 km. check-up would have to wait. We opted to skip that same campsite because it started to rain again. We drove closer and closer to Padua without a plan, and as it got wetter and wetter (keeping in mind our sleep sacks and tent were already soaked,) we began leaning towards a hostel or hotel. But first, out appetites were calling AGAIN. So we went to a SUPER and Jon, who yesterday made us buy a hand grill and charcoal, made us buy hot dogs, guaranteeing--Joe Namath style--that they would get cooked tonight. In Padua, we followed the signs to a park. It was still raining, but not hard, so we found a spot under some trees and started a fire in the deserted city park. The hot dogs were awesome. We had mini-buns and cheese with them. We were supposed to get three each, but we all started getting full. Jon, though, inhaled 4 1/2. Plus we had a bunch of snack crackers. We had a pie and fruit for later. After dinner, Matt called and then led us to a HOSTEL. 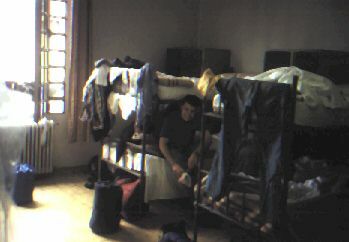 Our 1st hostel. We barely scraped together the $12 each we needed in lira. After waiting in line a while, we had a bed and hot showers only a two minute walk from the town center which was celebrating the 800th anniversary of St. Anthony. There was room for 16 in our room, but there were only five other guys there. While we waited for each other to clean up to go out on the town, we took turns talking to a fellow traveler we will call Nietsche. As we chatted, we ate our chocolate pie with strawberries. Matt and Jon went down stairs before 10 p.m. to get our sleeping bags. (MATT) And guess what we found? I was looking in the trunk for the sleeping bags, so we could dry them out while we slept, but they weren't there. 1 was confused for a minute and then spied them in the back seat (where we never leave them.) At first, I didn't grasp the significance of this detail, but Jon (being from Detroit) grasped what had happened. "Somebody broke in," he said. "Why?" I responded because I knew we all we had was dirty laundry in the car. The back (small) driver's side window was shattered. Someone had opened the trunk from the back seat (an unfortunate design flaw of the Renault 19.) We opened it up and quickly realized that one of Sam's swords from Toledo was missing, but since there was nothing else of value in the trunk (except Sam's other sword) there was nothing else to take. We took the bags upstairs and told the boys (who were still talking to Neitsche.) Chris and Jon went to the police station to report the break-in while I talked to Nietsche and tried to write in the log. (CHRIS) Even though the police station was supposed to be just around the block, all the streets were one-way and curvy and it was raining and there was tons of traffic and it was dark and the local soccer team had just won a playoff game in overtime and the soccer hooligans were driving about with flags and honking horns and acting like a bunch of drunken Italian idiots (which they were,) and we were new in town, and it was almost the 800th anniversary of St. Anthony, and we got lost. Jon was driving, gripping the wheel very tight, and repeating over and over again, "Bastards. Bastards." Pretty soon, Jon, who can drive crazy and honk horns with the best of them, joined in the speeding and noise, and we had a good laugh. After 30 minutes, we got to the police station, and were able to rise above the language barrier just barely long enough to fill out a form with a friendly officer. We reached the hostel just a minute before the 11 p.m. lock-out. Jon thought the culprits were other hostelers, but I think they were soccer hooligans. (MATT) After they returned, Sam and Neitsche talked over my bed for about an hour and then took their mutual interest into the living room when the lights were turned off. In Sam's defense, they had begun talking about religion and Neitsche turned out to be an atheist Jew (another Theo Kaufman) and Sam did his best to enlighten him and impress him with his conviction.